← Who’s in charge of this house? Yesterday, January 14, 2013 it poured rain. Yes Darrel and I still live in Fairbanks. We have had several warm days in a row courtesy of a “pineapple express” weather system but yesterday topped it. Rain. Rain, And rain. It was supposed to be followed by 6 inches of heavy snow last night but that never materialized. What happens when it rains in January in Fairbanks? Well, everything turns to ice. And now that it’s below freezing even the snow is crunchy again. By Thursday it’s supposed to be 20 below. And besides an epic storm, what else happened yesterday? 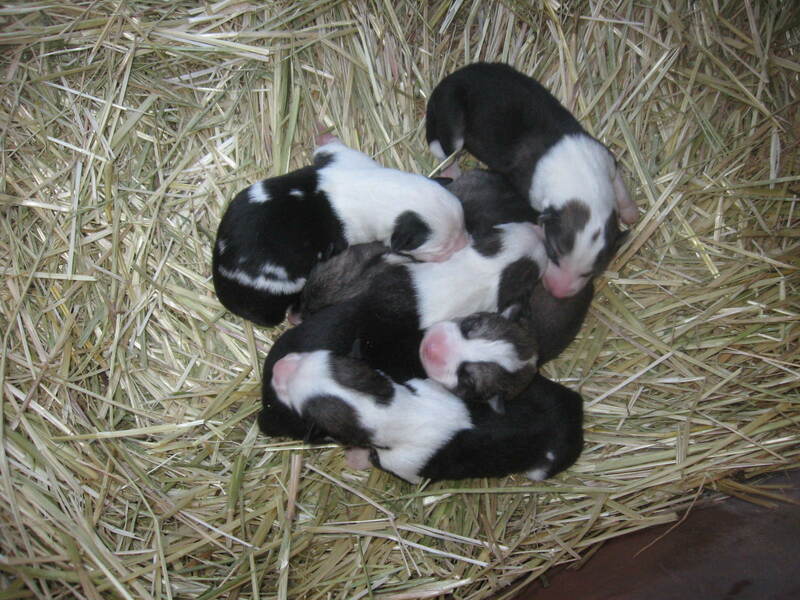 Meet the storm litter on their second day of life. Four boys and two girls. Mom, Dini, is doing just fine. She is the great-great-granddaughter of my first lead dog. Scotty was an awesome leader and her descendants have proven to follow in her paws. 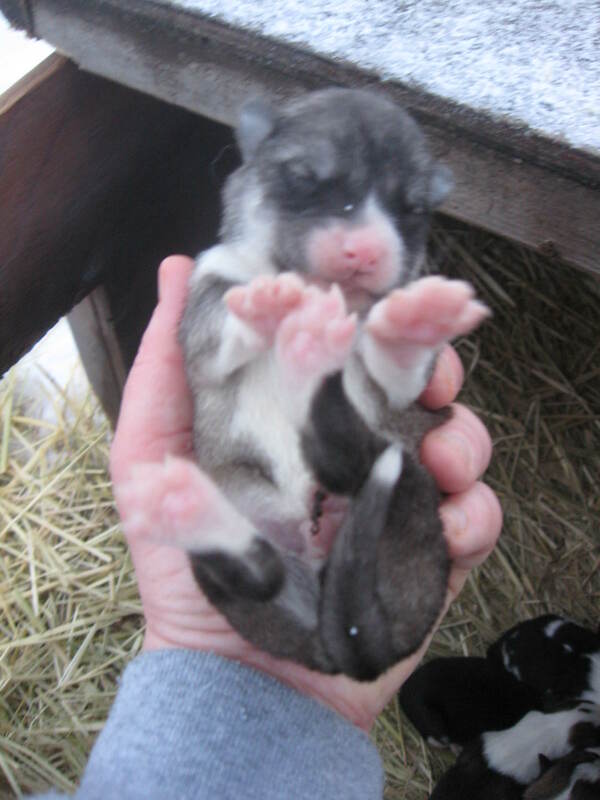 Some mushers name their litters according to themes. I’ve never done that because I like to see what personalities develop. I may make an exception this time. It is hard to resist Snow, Rain, Ice, Storm, Slide and Wind! This is the little runt! And here is the biggest one with a belly full of milk. It’s sometimes hard to believe how perfect they are, right down to their little toenails! If I was in charge of creation I believe I wouldn’t have remembered the toenails. 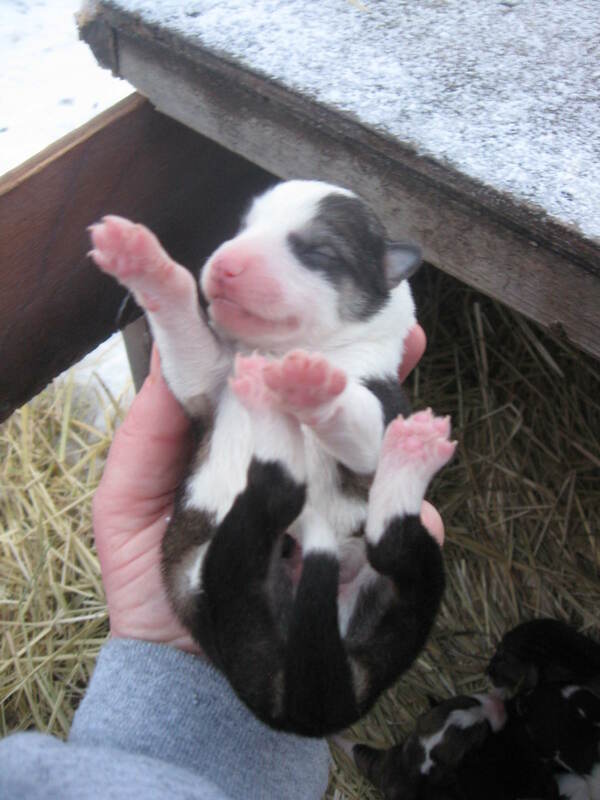 This entry was posted in Uncategorized and tagged Alaska puppies, husky puppies, ice storm Fairbanks. Bookmark the permalink. Amazing how these little creatures can touch our souls !!!! !